Following Tuesday night's 3-2 defeat at the hands of the NL East rival Washington Nationals, the Phillies have played the schedule to a 12-13 record during the month of August. While that might now seem like too bad a mark, a look at the club's recent play and some of the mitigating circumstances shows that they are entering September in much worse shape than fans hoped would be the case. Over the last two weeks the Phillies have won just four of their 13 games, and have now lost four consecutive series of three games or more. Only the two game Interleague split with the White Sox was a non-loser in that stretch. During this stretch, other than the pair against the Chisox, the Phils have faced some really good, contending ball clubs in the Los Angeles Dodgers, Saint Louis Cardinals, New York Mets, and now the Nationals. Those four teams are a combined 50 games over the .500 mark, and the group includes two divisional leaders (Nationals, Dodgers), one of the two current NL Wildcard teams (Cardinals) and a Mets club that is just 2.5 out of that WC race. However, more than the competition level is at play here. The Phillies are simply not looking very competitive most nights, and do not seem to be playing with the same spirit, drive, and intensity that characterized their early season success. It was just two days ago that the announcement came, one that I had expected would be coming by this year's MLB trade deadline or soon thereafter: the Phillies had traded away longtime starting catcher Carlos Ruiz. 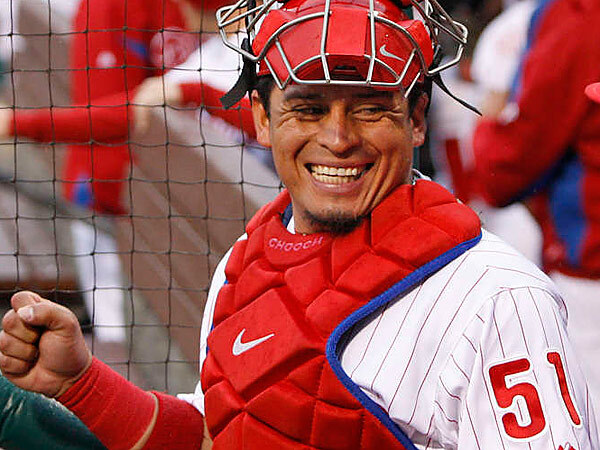 I wanted to wait a couple of days before writing anything, letting the departure of Chooch sink in fully, before trying to write anything that might have been overly emotional or sentimental in the immediate aftermath of the deal. Unfortunately, that is simply not possible with the Phillies primary catcher for the vast majority of the past decade, one of the pieces in what I have come to refer to as the Phils' "Core Five" that dominated the National League for a half-decade or so. Along with teammates Jimmy Rollins, Chase Utley, Ryan Howard, and Cole Hamels, Ruiz helped the Phillies win five consecutive NL East crowns from 2007-11. The group won the 2008 World Series together, back-to-back NL Pennants in 2008-09, and set a franchise record with 102 victories in the 2011 season. With all of the victories came a cleansing of sorts. More than a century of mostly frustrating futility from the franchise, aside from the oasis from the mid-70's through early-80's, was washed away. At the beginning of the 2016 Major League Baseball regular season, more than four months ago now, I came out with my predictions for the upcoming Phillies season. In that prediction piece, I picked the club to finish a dozen games better than their putrid bottom-of-baseball 2015 campaign, going 75-87 when the books were closed on 2016. That would mean that my prediction would show the Phillies to have played at a .463 pace over the course of this season. So where are the Phils now? On this day off in the schedule, the Phillies sit at 58-67 for a .464 winning percentage. To this point, nearly five months in, the club is pretty much exactly on the pace that I predicted at the beginning. But if you think back, there was a point in the season where everyone following the team was getting a bit ahead of themselves. Over the last couple of seasons, especially over the last calendar year, a concerted effort finally began to completely rebuild the Phillies minor league system. The results have been dramatic. Nearly every respected prospect evaluation resource places the Phillies organization near the top of their organizational rankings, and a number of the club's best individual prospects are featured across the most influential Top 50 and Top 100 lists. Those changes to the young talent flowing through the organization have already begun to yield results at the big league level, as inconsistent as some of those youngsters may still be at this early point in their careers. 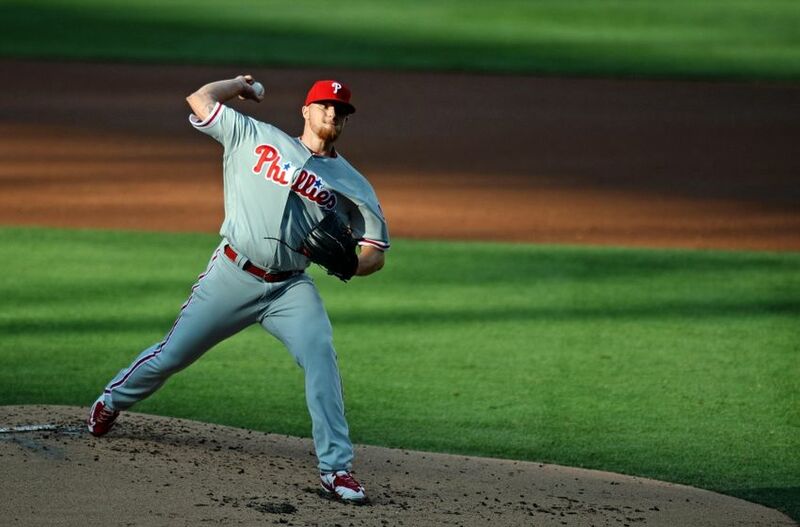 Pitchers Aaron Nola, Jerad Eickhoff, Zach Eflin, Vincent Velasquez, and now Jake Thompson all entered the Phillies organization in the last two years through trades or the MLB Amateur Draft, and all have already debuted with the Phillies starting pitching rotation. Among position players, Maikel Franco is in his first full big league season at 3rd base, Tommy Joseph is showing power at 1st base, and center fielder Odubel Herrera followed up his 2015 rookie campaign with an appearance in the NL All-Star Game this year. Now a new, even younger group of highly regarded prospects is beginning to make their move, having reached the highest levels of the club's minor league system. 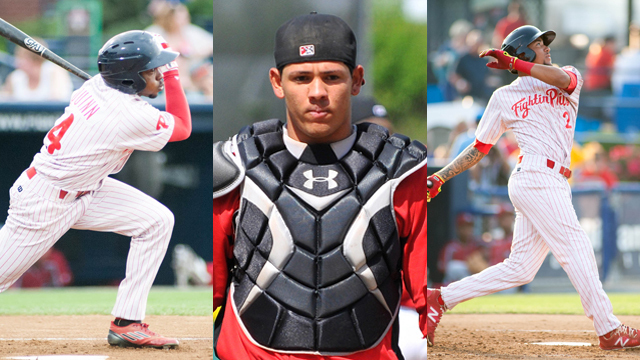 They are poised to make their own Phillies debut, some next month, some next year. It is very seldom that an actual Major League Baseball game takes a backseat to some event unfolding within the context of that game, but such was the case on Tuesday night at Citizens Bank Park. A mid-week crowd of more than 28,000 were in attendance, and the odds are that the majority were there for the same reason, to personally welcome back a former favored son, Chase Utley. Utley, the Phillies record-setting and World Series-winning 2nd baseman for more than a decade was back with his new club, the Los Angeles Dodgers. It was Utley's first appearance in South Philly since being dealt away to LA last August. The Phillies top pitching prospect, 22-year old right-hander Jake Thompson, made his highly anticipated big league debut. But the host San Diego Padres got to him early, and held on late for a 9-7 victory on Saturday night at Petco Park. Thompson (0-1) allowed six earned runs on seven hits while striking out one batter and walking two over his 4.1 innings. He also hit a batter and threw a wild pitch, and threw 53 strikes among his 83 pitches. The rookie was particularly hard to watch in the 1st inning, exhibiting stereotypical wide-eyed, first-time-out jitters in surrendering four runs on three hits, two walks, and the wild pitch. The big blow in that first frame was a two-out, bases loaded double off the bat of Christian Bethancourt that cleared the bases and made it a 4-0 game.